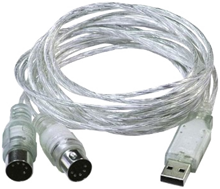 Most modern MIDI controllers can be connected directly through USB to your device but come with a standard USB connector. If the controller is USB MIDI compliant it will work out of the box and can be connected with the USB adapter to your iPhone or iPad. Check the power requirements of the MIDI controller, in case it is possible to power the MIDI controller with a power adapter it is better to do so to spare the battery of your iPhone or iPad.